How can companies share knowledge instead of just collecting information? Knowledge management in companies is far more than the administrating and managing information or especially documents, and pertains equally to internal collaboration as well as to external communication. 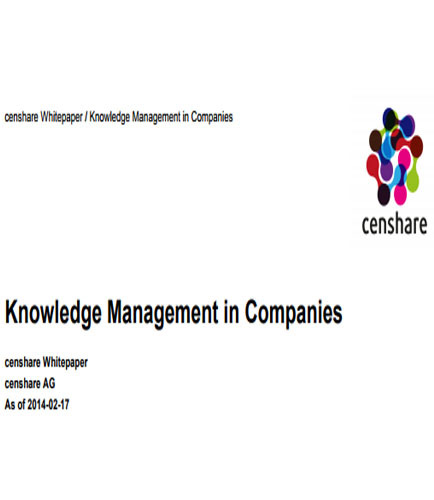 Knowledge management must be anchored in the company as a strategic task! This whitepaper will help you understand the power of knowledge management in companies and equip you with the tools needed to deliver that power and augment the intelligence of your organization. First, What is Supplier Quality Management (SQM)? Supplier Quality Management is a confidence in supplier's ability to deliver a good or service that will satisfy the customer's needs. Supplier quality management and performance monitoring are key components of any risk management strategy.Performing risk assessments to identify, quantify and prioritizing risk is the most important factor. This descriptive whitepaper brings you the best practices for implementing a successful risk-based supplier quality management system, and explain the requirements that should be clearly defined in a supplier quality agreement. It addresses questions like: What are the methods to improve supplier quality, increase visibility and connect the supply chain to your Quality Management System? What are the benefits of connecting the supply chain to your Supplier Quality Management System? How to alleviate security concerns associated with it? How can you bring greater visibility into the supplier quality and compliance by implementing a Supplier Quality Management System? How to evaluate Suppliers through Supplier Quality Management Programs? Supplier Quality Management: Risk Assessment,Risk Quantification,Risk Prioritization Download this whitepaper that gives an idea of a comprehensive Supplier Chain Quality Management that fosters the ability to collaborate with the supply chain, improve compliance and keep your data secure in the process. Knowledge is among the most valuable strategic assets in the life science organizations today. Exploiting the research information to effectively turn it into knowledge is crucial in the competitive environment of life sciences industry. Electronic Lab Notebooks (ELNs) offer an effective knowledge capture and data management solution for today’s information-rich laboratories. But how maximum value can be extracted from a life sciences organization’s primary asset – knowledge? This whitepaper provides the organizations with secure knowledge management that can be accessed and shared with ease. It includes: Capture, protect and exploit corporate knowledge Increasing efficiency and productivity with ELNs Return on Investment (ROI) of an ELN It also fulfils each researcher’s requirements of an Electronic Lab Notebooks in one application, minimizing IT support and protecting corporate knowledge in a fully compliant environment.